Photo by Armand Dragonetti. 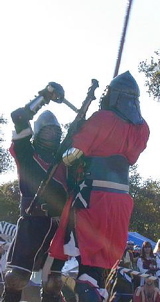 The knight in red is Mahdi fighting the final round of the Oct. 2001 Crown Tournament. to cross King’s Arrow Bridge. that e’er they came to King’s Arrow. when the Tr’marin host upon us come. They bathed their hooves in western blood. they deserted at the bridge. Trimaris took their pledged sword. that e’er we came to King’s Arrow. to take King’s Arrow Bridge. You’ve scarcely got a hundred men. who betrayed us on the Bridge. But they all fell in death’s dark dance. “Let them cross King’s Arrow Bridge.